This is Day 13 of our 31 Days of Less & More challenge. To read all the posts in order, start with Day 1, then visit the Overview Page to see the entire series. I remember so clearly my very first email experience. It was the first week of my freshman year of college. I was eighteen years old and the World Wide Web was still a Really Big Deal, so much so that my college actually required all incoming students to take a semester-long class on how to use the Internet. The first six weeks were devoted to learning how to use a search engine. (This was even before Google! Remember Lycos? Search, Lycos, search! Good Dog.) Yikes. Oh my, how times have changed. This was even before AOL and that friendly little phrase you’ve got mail. Email wasn’t yet available in HTML; there were no pictures, just words, and so few people had access to it that for those of us who did, it was actually a pretty useful method of communication. Getting an email was such a novelty that I whenever I passed one of the special email terminals set up around campus, I couldn’t resist logging in, just to see if I’d gotten something. Fast forward seventeen years and I can very safely say that the novelty has worn off. There is no special thrill I get when I see I’ve received a new email. Instead the sheer volume of incoming mail feels oppressive, overwhelming, never-ending. Between the hundreds of retailers vying for my business, the messages and forwards from friends or family, work-related inquiries, and notifications or requests from school and church and all the other organizations out there, the emails Never. Ever. Stop. Perhaps it is just me, but that old temptation to log in is still just as strong. In fact, that compulsive need to “just quick check” might even be stronger now, and it is certainly more convenient now that email is readily available on my laptop and my tablet and even my phone. Turned off all notifications from social media sites to slow the flow of incoming mail. Automatically marked junk mail and all retailers as spam so that they wouldn’t show up in my inbox again. Created folders and “rules” to automatically sort incoming mail. Stopped checking email first thing in the morning and instead saved it for the last task of the day. Began using the “5 sentence rule” for almost every email, keeping both my own emails and my responses as brief as possible. Removed my main work email from my phone so that I can only check it on my computer during designated times. Turned off all alerts & sounds on my phone and computer so that there are no “pings” to distract me every time a new email comes in. Oh, what a difference this new strategy has made! If you are struggling with an overwhelming inbox, taking even just a few of these steps to reduce the load can help immensely. I promise you won’t regret it. Tame your inbox. Start by doing a mass delete of any unread emails more than a week old. Next, check the spam box for all promotional & junk emails. For most email services, this should prevent them from showing up again. If you can, create folders and rules to automatically sort incoming mail. Now it’s time to write a note! First, search around and find our best pen and some paper or stationary. Next, find a comfortable, well-lit spot to write. Then write a letter to your spouse or to each of your children—being sure to include the date, time, a loving greeting, and meaningful, heartfelt sentiments. It doesn’t have to be long or complicated, just a few sentences expressing yourself in love to someone. Be sure to also read Crystal’s latest post on Less Discontentment/More Gratitude. 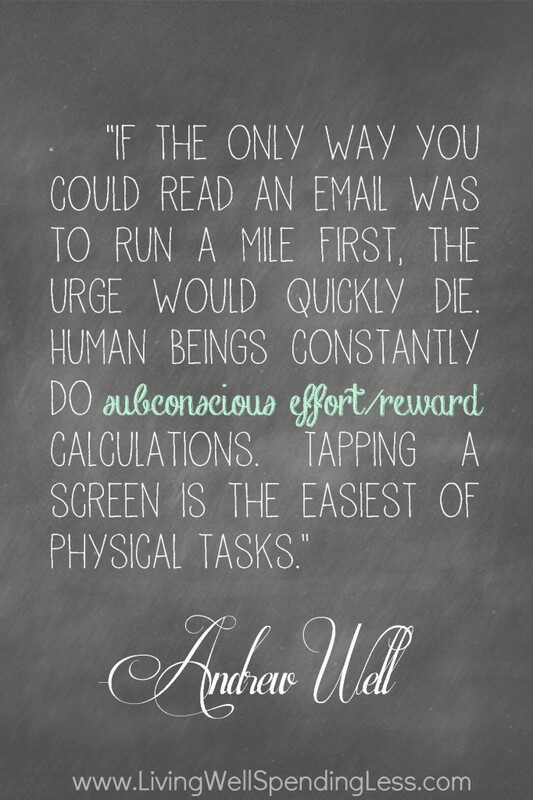 Are you ever overwhelmed by your email inbox? What steps are you going to take today to tame it? Your story about taking a class on how to use the internet cracked me up. Times really have changed! This post really did hit close to home. I am definitely guilty of checking my email and my phone a million times a day “just in case.” I love your tips and I am definitely going to spend some time taming my inbox TODAY! Thanks Ruth! I love this post. I am constantly working to eliminate the amount of junk emails I get and often delete emails without ever opening them. That being said, there are still times I light up when I receive an email and I covet each of those. As a military spouse, I spend a lot of time apart from my husband. Snail mail is just that…snail mail. I am never more grateful for technology than during a deployment. There is something absolutely precious about seeing my husband’s name in my inbox and reading the words he found time in his busy day to type just for me. And sometimes those words are the most meaningful words he has ever said or typed. I absolutely agree that email has lost the thrill it once had and a handwritten note is a lost art we should embrace once again, but at the same time, how great would it be if we surprise a friend or family member with an email that speaks to their heart?!?! In this day and age, I can’t help but wonder if others might find it equally exciting. google worked acceptable for me. Anyways, I would like to appreciate you for adding awesome blog post. I’m guessing it has been helpful to plenty of people who arrived here. post, I’ve book marked your web blog.